A few years ago, I was praying and I felt like God was asking me to start daily Eucharistic Adoration in my parish. Four (or five?) years later, it is still going strong, twelve hours a day. Certainly there are bumps in the schedule, but for the most part, it has been an incredible blessing to the parish. I did what I thought God was asking me to do and the people followed. Along with that, I thought God was asking me really to let our parish be a place to pray for priestly vocations. We pray at almost every Mass for that intention and the adoration chapel is especially geared towards praying for vocations, seminarians, and priests. God has blessed us with numerous priestly vocations in the past few years. I did what I thought God was asking me to do and the people followed. This came to mind the other evening when I was with a group of parishioners and mentioned a new idea that I think God may be placing in my heart. I'm not entirely yet convinced of the exact plan, but I feel like the Lord is asking me to do an all out offensive on Evangelization in both of my parishes. As I explained some of the ideas, one of my parishioners said, "Father, whatever you do, we'll follow you." Without knowing it, he brought a lot clarity to me about why we've been so successful over the past few years in our endeavors. It has to do with obedience. Obedience to God's will and obedience in following the shepherd that Christ has put in place in the parish. Even if not all of our plans turn out perfectly, those who have been actively engaged in the life of our parish for the past several years know that Jesus is doing something here in our midst. He's blessing us with some extraordinary graces. This is not meant to be a self-promoting commercial. It is just to say that when I try to be obedient and when the people try to be obedient, beautiful things happen. Right now, I'm the pastor of one parish and school and the administrator of another parish. We are also in the process of trying to merge (either completely or in part) three parishes into one. All of these things involve countless meetings, emails, numbers, property concerns, budgets etc. Thankfully, we have solid lay people who are doing much of this work. But, it is time consuming for me. And, while it is all good, I don't want to spend my life simply planning for the future. I want to spend most of my time doing the work of the Kingdom here and now. So, what is my thought? Well, I want both of my parishes to grow. Not just a little. I want them to grow big time. Not through gimmicks but through solid, faith-filled evangelization. Last night I was having dinner with a young man from the parish who is applying to the seminary. I told him about the idea and he said, "Father, just do it. This parish prays for vocations all of the time and here I am applying to the seminary. So, let's ask God to send hundreds of new parishioners. Maybe that is what he is waiting for--just to be asked." Part of the reason for this blog post is my hope that maybe somebody will know something about this and get back to me. I'm thinking about a thing called Parish Evangelization Cells. Or other ways of going about Evangelization? What I like about this Evangelization Cell idea is that it engages the laity in the work of envangelization. Anyone have any experience in this--positive or negative? Basically, I know that I have to do something because God is putting this thing into my heart. I just need a solid way to go about it. Whenever I and my people have been obedient to what I think the Lord is asking, the Lord has blessed it a hundredfold. So, I'm fairly confident that Jesus wants me to move forward on this one. I know the first place it starts is with prayer. But, we also need a strategy. So, if you know about these Evangelization Cells, I'd appreciate your thoughts. If you don't know, I'd still appreciate your prayers. We Catholics possess the best news there ever will be. Sharing this good news is what we should be all about. The Holy Spirit ultimately is the one responsible for bringing persons to Christ. I'm tempted to give God a number . . . like a thousand new parishioners . . . but I think I better leave the numbers up to him. It begins with prayer and with obedience. So, I'm going to pray some more and I hope that my people do to. And then, if we know that God is speaking to us, then we should be obedient and "go out and make disciples." The New Evangelization: A Gift, Not an Insult! During the past few months, I've spoken with numerous priests who have expressed a certain amount of difficulty with the term, "The New Evangelization." For those of us who grew up in the pontificate of Pope John Paul II, were formed as Christians during that time, and who were ordained during or since that pontificate, "the New Evangelization" is basically how we see ourselves. We are part of something new. The term doesn't threaten us or insult us. But, I've come to appreciate the fact that a lot of older priests are bothered by it. I think when they hear the term, they interpret it as meaning that they've spent the last 30, 40, or 50 years of their life not evangelizing. They interpret this call for a "New Evangelization" as a criticism of all of their efforts and work during the previous decades. Truth to be told, probably some of us who are younger priests have sometimes thought that the "New Evagelization" is a rebuke of what came before us and that we have arrived just in time to save the day. The call for the New Evangelization is not a rebuke to priests of any generation. It is, however, a call to all priests and to all the faithful. Most of us who grew up surrounded by the call for the "new evangelization" see it as a movement of the Holy Spirit for the whole Church. For many of us, we've never sat back and tried to define it because we felt like we were in it. We felt like a great new moment of youth (instigated by an old Polish Pope) was being infused into the life of the Church and that we are being led to a reinvigorated missionary zeal. When we hear Pope Benedict, for instance, make this call for a New Evangelization, we do not hear it as an attack on what came previously. We hear it as a new moment in the life of the Church. The reason for the need for a "new evangelization" is not because of the failures of others, but because we are living in a "new moment" in the history of the Church and the world. The life around us has changed and the ground has shifted. As in a sport or in a war, evangelization has to strategize and act according to what is happening on the field. So, when a battle plan is adapted or a team changes its strategy mid-game, it is not an admission of failure. It is not to suggest that the soldiers who already fought were inadequate or that the players were unfit. Strategy always needs to take into account the new circumstances. The circumstances on the ground have dramatically shifted. The Church is bleeding members. That's why we need a New Evangelization. Secularism dominates so much of the culture and young people are being immersed in it. That's why we need a New Evangelization. There is widespread ignorance of foundational Catholic Doctrine among Catholics. That's why we need a New Evangelization. In many places, Catholics have left the Church because some other group welcomed them and taught them about having a personal relationship with Jesus Christ. That's why we need a New Evangelization. Fewer and fewer Catholic men and women are married in the Church, are having their children baptized, or are raising their children in the Faith. That's why we need a New Evangelization. The Faith that needs to be communicated remains the same. But, the New Evangelization is about transmitting that Faith in ways that respond to the needs of the day. I think it is not unfair to say that for a good long period of time, the Church in the United States (for instance) was able to survive on the work that was done by previous generations. But now, we desperately need to sound the trumpet and enthusiastically, intelligently, and faithfully set out to evangelize with a more robust zeal. In the past, I think it was safe to presume that Faith was present and things could be built from there. But now, I think, the popes are pointing out to us that Faith can no longer be presumed. They have been indicating to us that there is a tremendous need to return to the person of Jesus Christ and introduce people to Him anew. The call for a new evangelization is the call for all of us to become more in love with Jesus and to communicate that love more effectively to others. It is to go back to the foundation of our Christian life and to be faithful to the experience of that friendship and to live out of that friendship. It is the call to engage the people of today, in these particular circumstances, with the good news of the Gospel. It might require all of us to shed some ballast. It may require us to do things differently, to speak differently, to pray differently, and to preach differently. It definitely requires all of us to love Jesus more, to deepen our friendship with Him, and to bear witness more willingly to the power of Christ in our lives. One of the things that I find difficult as a pastor is that so much comes all at once. There are finances, budgets, property issues, political battles (such as Religious Freedom, Physician Prescribed Suicide etc), and the day to day running of two parishes and a school. I suspect that most pastors feel this burden. There's always so much that has to get done and all of it is always urgent! And, all of it is part of the life of the Church. All of these things are important and necessary. But, we don't want to forget the "one thing that is necessary" and that one thing is Jesus. Everything else we do has to begin with our Faith in Jesus. Am I insulted as a priest or as a Catholic because the Pope keeps calling for a New Evangelization? No. In part, that's because I am in need of the New Evangelization. I continually am in need of returning to Jesus and remembering what He does in my life. I need to bear witness to that in my life. I need to share that with others and I need to hear others witness to their encounter with Christ. The New Evangelization is about Jesus Christ. Yes, Jesus Christ is the same yesterday, today, and forever. But, the world has changed dramatically during the past few decades. The New Evangelization is a call for us to feel once again the urgency of the Mission of the Gospel. It is to feel once again overpowered by the Love of Christ compelling us to proclaim the Gospel to those around us. This urgency is something I need in my life. It is something I need new in my heart every morning. I need every day to come face to face with the fact that Christ makes all things new and I need Him to put into my heart an urgency to share that fact with others. For me, this is the the New Evangelization. And, I'm not insulted by it because I need it! Often enough, I've heard people say things like, "Thank God for doubting Thomas because I'm a doubter too." I think that's a bad perspective to have. We want to imitate Thomas not in his doubting, but in his believing. The good news of the Gospel is that Thomas came to believe. It would be a sad story indeed if St. John the Evangelist had recorded Thomas' last words as being, "I will not believe." That would be quite the disappointing end to the Gospel. None of us would feel like exclaiming, "Praise to you Lord Jesus Christ," if that were the end of the Gospel. What is so beautiful about the Gospel for the Second Sunday of Easter is that Thomas came to Faith. So often in life, people say platitudes that mean absolutely nothing. One such platitude is, "It doesn't really matter what you believe, as long as you believe something." (Vomit here). It does matter what we believe. The substance of our Faith is as important as the act of believing the substance. What we believe shapes how we act. What we believe can save us. If you were getting married and the person you were marrying said, "Well, I believe that marriage doesn't require fidelity," then I'd suggest you put together a new search committee. Believing matters. If it didn't, then Jesus wouldn't have bothered going back to that upper room a second time. After all, ten of the eleven remaining disciples were there and they believed. If believing wasn't such a big deal, he could have let Thomas believe whatever he wanted. But no, Jesus goes back to that upper room so that Thomas would come to believe. And what did Thomas say when he sees Jesus there? Did he exclaim, "Jesus, it's you! My old friend! You're a dead man who has been raised from the dead!" If Thomas had exclaimed this, it would have been understandable. That's what he saw. He saw his old friend who had died, now alive. But, if that was what Thomas exclaimed, then St. John could have saved himself a page from the Gospel. No, as the early Church Fathers teach us, Thomas saw one thing and believed another. He saw his old friend risen from the dead. But he believed something much greater. He looked at him and said with Faith, "My Lord and My God." That's why Jesus went back to that room a second time. He wanted Thomas to believe. That's what Jesus wants for all of us. He wants us to have greater Faith. It matters what we believe. Jesus wants us to see with the eyes of Faith. He wants us to look at what appears as bread and wine and to exclaim, "My Lord and My God!" He wants us to look at a man in the confessional wearing a purple stole and see the Divine Mercy of God. He wants us to see an aged man in Rome and see the Vicar of Christ on Earth. This is what Faith does. Faith matters. Sometimes, people talk like it is cool to be a doubter. It isn't. Imagine if your spouse said, "I believe my wife about most things." Or, "I believe my wife, 90% of the time." I'm guessing the car ride home from that party would be quite interesting. Well, when it comes to matters of Divine Faith, a totality of Faith is so much more important. We sometimes talk about Faith as though what it really means is, "I concur with this because it agrees with my way of seeing things." That's not Faith. I don't know if you've ever had this experience, but I have. And sometimes, I've done it to others. Let's say, for example, you are looking for something. Somebody decides to help you and they open a drawer. You say, "I already looked in there." They answer, "I believe you, but I'm going to look anyways." That always infuriates me (and I've done it to others). What they are really saying is, "I don't believe you enough not to check it myself." Well, when we refuse to believe until we have exhausted every ounce of research, double checking, and consultation, that's really not Faith. Faith is a gift that accepts God's word as true. We believe first. We seek to understand what we believe, but understanding doesn't precede Faith. Thomas didn't understand what was going on in that upper room. He just believed that Jesus was God. Pope Benedict XVI has declared the coming year--beginning in October--as a Year of Faith. It is an opportunity for all of us to deepen our Faith. He has spoken a lot about focusing upon the encounter with Christ. Faith arises from a personal encounter with the Lord Jesus. These past few days, I've been trying to clear off my desk and to think about all of the projects, meetings, and details that are filling up my life. And, as I did so, I thought, "I need to focus on Faith this year." I don't know what that means exactly, but I know that my desk is pretty full right now, but Faith trumps all of the rest of it. "And the victory that conquers the world is our faith." That's what the First Letter of St. John says. We have to aim at being victorious as a Church. And the only way to be victorious is for pastors like me to focus upon Faith. How am I going to do that? I'm not sure yet. But, I'm going to get busy figuring it out. Jesus came back to the upper room a second time, so that Thomas would believe something far beyond his natural capacity. Jesus wants us to believe too. The reason we read that Gospel is because Thomas became victorious that day when he passed over from a doubter to a believer. Jesus wants us to believe so that we can be victorious. Let's believe and win the victory. A seminarian told me the other day that as a result of the new translation of the Mass, the Exultet is now 23% longer than it was before. (Seminarians are always good for such facts.) Having sung the Exultet this year at our Easter Vigil, I can say that it definitely felt longer than in previous years. Those who had to listen to me chant it would probably agree. Among the differences in the new translation is the return of the bees. For some reason or another, in the old English translation, mention of the role of bees in the making of the candle was omitted. But, in the new translation, we once again hear how the candle is made from the work of bees. 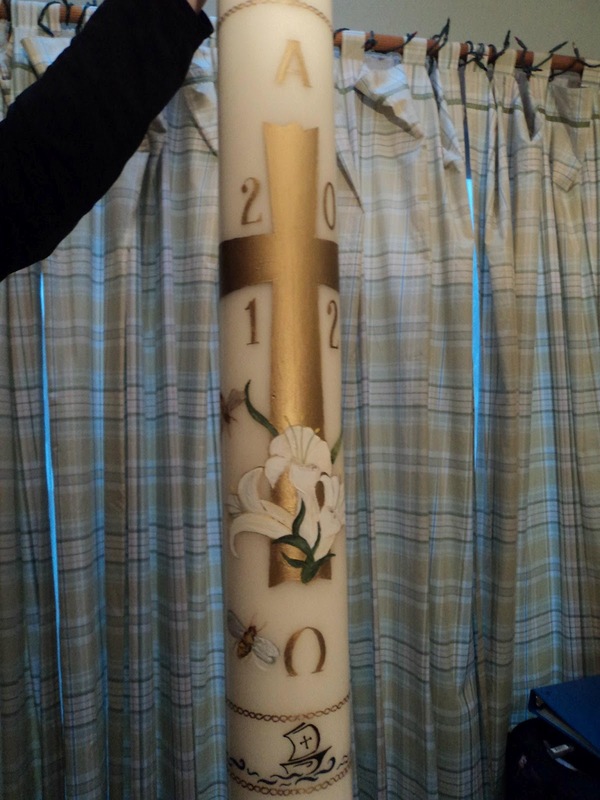 In honor of the return of the bees, I asked the parishioner who painted our Paschal Candle this year to place upon it some bees. She did a great job too. The central symbol for the Easter Season is the Paschal Candle. Into the darkness of the night, the deacon or priest elevating the Paschal Candle proclaims, "The Light of Christ." In this proclamation, the Church announc,es that the light of Christ conquers the darkness of sin and death. The light of Christ illuminates every darkness, entering now even the tomb itself and casting away its seemingly definitive darkness. Because of this light, we see all things in a new way. The radiance of Christ shines and transforms even death itself. The Exultet makes clear, however, that this central symbol is made possible through the work and effort of the bees. In a similar way, in order for the light of Christ to shine in the midst of the darkness of this world, it requires that Christians be like the bees, dutifully attending to the tasks entrusted to them. Christ the light shines in today's world in and through the lives of faithful Christians. Sometimes, the work entrusted to us seems distant from the final product. The bee collecting nectar from flowers seems far removed from the five foot candle shining in a dark church on the Vigil of Easter. Parents dragging their rebellious four year old to Mass on a Sunday morning can seem more hassle than it does the radiant beauty of the light of Christ. But, it is in the daily carrying out of the work that Christ has entrusted to us that his light is made able to shine into the darkness of the world. Carrying the candle into the darkness of the Church and proclaiming, "Christ the Light," is a privilege. But, the Exultet doesn't want any of us to think that it is as easy as that. The candle is the work of bees. So too, if we want to bring the light of Christ into the darkness of the world--into the darkness of people's lives--then we have to be like the bees. All around us, people are in darkness. There are those in the darkness of sin, despair, pain, suffering, addiction, sorrow, and death. The transformative light of Christ can illuminate these situations and bathe them in the warm glow of the Resurrection. But, it is not like striking a match that lights quickly and then is extinguished. The Easter Candle burns steadily because it is made from the hard work of the bees. Similarly, Christ's light is able to shine most effectively when Christians do the hard work of building a culture. Building a culture is hard work and it demands sacrifice. The bees have to go out every day and gather nectar from the flowers. Catholics need to go out every day and be faithful to the Sunday Mass, to Confession, to prayer, to tithing, to giving time to their parish, to the Corporal and Spiritual Works of Mercy, to obedience to the Church, and to the virtues. All of these things can seem remote from dramatically entering into the darkness of a church carrying the only light. But, Christ is depending upon us to do the hard work so that his light can reach those who need it. Sometimes in my work as a priest, I have the privilege of dramatically carrying the light of Christ into somebody's life. I admit that it is an awesome feeling to witness the moment when darkness is cast out and the transformative light of Christ illuminates somebody's heart and mind. But, I am able to do that as a parish priest because of the work of so many others. The parish is like the wax of the candle. It is built by persons who labor daily to grow in personal holiness and who labor daily for the good of their parish. Behind every dramatic illumination of someone's darkness is a colony of parishioners building a candle. Attending finance meetings, teaching religious education, singing in the choir, praying at daily Eucharistic Adoration, picking up bulletins left in the pews after Mass, cleaning the sanctuary, taking their children to Mass, bringing food for the poor, contributing generously to the collection etc, is the work of building a candle. Most of us, I think, want to carry the Light of Christ into the pain and darkness of others. For that to happen, we must humble ourselves and become like the bees who set out each day to do the work entrusted to us. The goal is to allow the Light of Christ to illuminate the darkness of others. For all of us, our part in that seems fairly insignificant. Our daily work of gathering nectar and making the wax can seem far removed from the drama of the Easter Vigil. But it is not. The great drama is that all of our little and seemingly insignificant efforts are taken up by Christ and used by him to shine his glorious light into the gloom of others. We are all simple bees in the Lord's service. Last night, after the baptisms, receptions into the Catholic Church, and Confirmations at our Easter Vigil, I looked at my iPhone just to gauge the time. We were two hours into it. But, on the screen of my iPhone indicated that I had missed a phone call and had a voicemail from the father of a young baby--Matthew--whom I had baptized and confirmed in an emergency on Monday evening of Holy Week. When I saw the name, my heart sank, presuming that there had been some turn for the worse. During the rest of the Mass, I prayed for Matthew and his parents and during communion time (I was not the main celebrant of the Mass), I slipped away to listen to the message. (This is the only time I've ever done something like that!) Matthew's Dad said that Matthew had breathed on his for the first time, that they had the opportunity to hold him, and to have a family photo with together. He said it was a great day, that they are grateful for all of the prayers being offered on their behalf, and that they are grateful to be part of our parish. Whatever is ahead for Matthew and his family, they belong to the Body of Christ. On Easter, we commemorate that day when Jesus Christ rose from the dead in his human body. All of those who are baptized into Christ Jesus have died with him and rose with him. As members of his body, we live in joyful hope of the resurrection on the Last Day. A whole parish of people are joyful today that Matthew has had some improvement. But, we are more joyful that Matthew is part of the new creation and is united to Jesus Christ. Baptism and Confirmation mean something. They accomplish something. They give what no one else can give. They give a share in everlasting life. The Resurrection continues today in Matthew. He is Risen. He is Truly Risen. The Passion today began with a question from Jesus. "Whom are you looking for?" It is an important question. At the depths of our soul, we are all looking for someone who will love us completely and eternally. At the end of the Passion today, Jesus says, "I thirst." He too thirsts for love; for our love. Imagine that. God thirsts for our love. 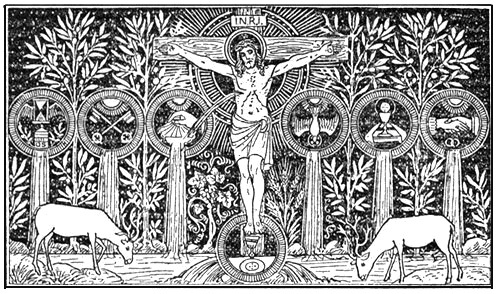 On the Cross, these two thirsts--the thirst of man for eternal love and the thirst of Eternal Love for man's response--meet in Jesus Christ. As God, Jesus reveals to us the depth of God's love. On the Cross we see that there is One who loves us completely and eternally. As man, Jesus opens the way for human beings to love God with all of their heart, mind, and soul. On the Cross, we see that God loves man eternally. And we see that man can now love God eternally. This is the definitive word on all of reality. Man's thirst for eternal love finds an answer in Christ. God's thirst for the love of man finds an answer in Jesus Christ and all of those who live in union with him. Love is the definitive word. The Mass of Holy Thursday is distinguished by a quiet intimacy and a sober beauty. In the tranquility of the Upper Room, Jesus provides a profound moment of friendship with his “chosen ones,” the Apostles. Soon, however, the stillness of this night will be shattered with the sudden appearance of armed soldiers entering the Garden of Gethsemane. From then on, the noise shall become inhuman and seemingly unbearable. The sound of a friend’s voice betraying him, the clanking of chains, the mocking cackles of the soldiers, the lash of whips striking the flesh of Christ, the shouts of the mobs, the wails of the women, the insistent denials of Peter, the panicky political maneuverings of Pilate, the sound of nails being driven violently through bone and flesh. The natural human reaction to this overwhelming noise of inhuman suffering is to run from it, to turn away and not face it; to pretend that it is not our concern. These sounds, however, are very much our concern for they are the sounds of our sinfulness. The chains, the mocking, the denials, the beatings, the nails—these are the sounds of our sins. We want to turn away from these things because they are too difficult to hear. We turn away either because we are overwhelmed with sorrow for our culpability or because we are duped into denying our culpability. Tomorrow, our temptation will indeed be to distance ourselves from the agony of the Cross, to turn away from it, to sanitize it. If we remain mere spectators of the Cross, then there will always be a distance between us and Christ. But, Jesus does not want this distance. He wants us to be with him tomorrow. He wants us to be in union with him. He wants us to stand with him tomorrow as his heart is pierced, as did Mary and the Beloved Disciple, John. Sharers in the Divine Love. No longer spectators, we are drawn into the Sacred Mysteries because in the Upper Room, the Heart of Christ pours forth Divine Love. Because of what happens in the Upper Room, we no longer experience the Passion and Death of the Lord as mere observers. We experience this Passion and Death in union with Christ. We experience it from the inside. How does this happen? In three ways that are really but one way. In bestowing upon the Church the gift of the Priesthood, Christ ensures that the Sacrifice of Calvary—the sacrifice of total and complete love—is made present in every age. When the priest offers the Mass, he makes present the Divine Love; the Love that saves the world. The priest makes it possible for us to enter into the Saving Mysteries. The priesthood is not a profession whose necessity will someday become obsolete. For there is only one Sacrifice that saves the world. That Sacrifice, offered once and for all on Calvary, is made present in every Mass. The priest perpetuates that Sacrifice and makes us able to enter into it—not as bystanders, but in union with Christ. When the priest says, “This is My Body . . . this is My Blood,” he makes present on the Altar the very same love that was present on Calvary. The priesthood flows from the heart of Christ, who loves those who are his own in the world and he loves them to the end. Secondly, in the Eucharist—given in the Upper Room—Christ communicates to his Apostles (and through their ministry, to us) everything that He himself is. The Eucharist is God and God is Love. When Christ gives to us his Body and Blood, he communicates to us his very self, pouring into our hearts the content of His own Sacred Heart. The priest offers the Sacrifice. The Body and Blood of Christ are made present and given to the Faithful. In this way, the Faithful are made one with Christ. His image comes to perfection within them. The Eucharist is God. God is Love. Ubi Caritas et amor, Deus ibi est. Where Charity and Love are found, there is God. These words are most true in the Eucharist. In the Eucharist is found the totality of Charity and Love. Yes, where Charity and Love are—there is God. At the end of Mass tonight, we will carry in solemn procession the Eucharistic Lord. In doing so, we testify to the centrality of Divine Love in the life of our Faith. We carefully reverence, protect, and adore the Holy Eucharist. On the night when the body of our Lord was carried away in chains, we carry him in love. In a sense, the soldiers were too late. They come to take away the Lord—to separate Jesus from those whom he loves. But they were too late; for he had already given to his Church the Eucharist. He loves those who are his own in the world. And he loves them to the end. Thirdly, in the Upper Room, we are given a new commandment. Having washed the feet of the Twelve Apostles, Jesus gives to them the commandment of love. This commandment is not some external law for us to follow. It is not something imposed from outside of our selves. This commandment is inseparable from the love that has been poured into our hearts. When he says, “What I have done, so you must do,” what does that mean? Is it simply that the Lord wants us to wash each other’s feet? Is it simply that the Lord wants us to serve others? No, it is much more than that. What exactly has he done that he wants us to imitate? He has loved us with Divine Love. He has poured himself out completely, even unto death. He has loved us and kept nothing from us. He has poured into our hearts the totality of himself. God is Love. Love is what Christ gives to us in the Upper Room and love is what makes us able to stay with Christ amidst the Agony of Good Friday. As we well know, all the apostles save John the Evangelist would abandon Christ once the external noises of terror began. So too in our life, if we live our Christianity simply from the outside, then we too will be swayed and terrified when we are surrounded by terror on every side. This is why Christ gives us Holy Thursday. On this night, Christ gives to us His Heart. He gives to us the capacity to live Good Friday with His own Heart. This is the grace of union. We are made sharers in the Divine Love. We live all things differently now because we live them through the Heart of Christ, with the Heart of Christ, and in the Heart of Christ. Jesus loves his own in the world and he loves them to the end. Tonight, we remain united with all those whom we love. We bow in humble adoration of the Love that has been poured into our hearts; a love that makes us new creations; a love that unites us to Christ; a love that makes us able to love with the Divine Love; a love that allows us to love . . . to the very end. On Tuesday of Holy Week, I will attend the Chrism Mass for the Archdiocese of Boston. At that Mass, Cardinal Sean O'Malley will consecrate the three Sacred Oils--the Oil of Catechumens, the Oil of the Sick, and the Sacred Chrism--that will be used throughout the Archdiocese for the coming year. The fact that the bishop consecrates the oils that are used throughout the whole Archdiocese connects him in a particular way to all of the sacraments that take place in every parish. The Chrism Mass shows forth the communion of the whole Church. We are members of the one Body of Christ. All of the old oils are burned this week and from the Chrism Mass on, the newly consecrated oils will be used for the coming year. Tonight, on the eve of the Chrism Mass, I used the old Chrism one last time. I confirmed Matthew John on the Monday of Holy week. While in the sacristy of church before the 6:30pm Mass, I took a phone call from the hospital. It was 6:26pm. A beautiful family from my parish was in great distress. During labor, some tragedy occurred and a seemingly healthy little baby boy stopped breathing, was resuscitated, but was in very grave condition. My parishioners understood why I needed to move the 6:30pm Mass along. We prayed for Matthew John and by 6:55pm, I was at the hospital with a grieving family, a grieving hospital staff, and a very beautiful but very sick little infant boy. We professed the Faith together, and then I had the privilege to say, "Matthew John, I baptize you in the Name of the Father, and of the Son, and of the Holy Spirit." Then, almost exactly a year to the day that the Archbishop consecrated the Chrism, I anointed Matthew John and administered the Sacrament of Confirmation. He is a member of the Body of Christ. I sent out word that this baby and his parents needed prayers. The Body of Christ began praying. High School students in my parish Religious Education program stopped class and prayed the Rosary for them. Facebook messages all promised prayers for Matthew John and his parents. A small group of parishioners came to church and prayed the Rosary with me at 8pm. The Chrism binds us together. It binds us to Christ in Baptism, Confirmation, and in Holy Orders. The Chrism binds us together into the Body of Christ. It binds us together in Baptism and Confirmation. It binds priests together in the presbyterate and with the bishop. It binds Matthew John to me, to the bishop, and to the whole Body of Christ. Whether we were Christians or not, such a tragedy would bind us together because of our common humanity. But the Chrism binds us together differently. This baby and his family are part of the Body of Christ. Frankly, I'm too exhausted right now to think about what that all means or to write coherently about it. But, I'm grateful for the Chrism. I'm grateful that there are Sacraments that touch far deeper than any medicine can. I'm grateful that a beautiful baby and his family are bound closely to Christ and to His Body, the Church. I'm grateful that because of the Chrism, I could witness the beautiful faith of these people in the midst of so much sorrow. I'm grateful that whatever happened on Calvary and whatever happened in the Upper Room on Holy Thursday and on Pentecost is able to reach us here and now through the Chrism. Whatever happens in the coming hours, Matthew John is bound to Christ's saving Passion, Death, and Resurrection through the Sacred Chrism. He is bound to all of us who are members of the one Body of Christ. He is bound inseparably to Christ through the Sacraments of the Church. That is our consolation tonight. Matthew John and all of us are bound to the Savior through the power of the Sacred Chrism. (Please pray for Matthew and his beautiful family). Sometimes somebody will complain to me about something that is occurring in the Archdiocese of Boston and will ask, "Why isn't the Cardinal doing something about this?" Or, they will complain about something going on in the United States and will ask, "Why aren't the US Bishops doing something about this?" More often than not, the person is justifiably upset. They see some aspect of the Church's life being demeaned or undermined. Perhaps it is a liturgical or theological abuse or some glaring moral issue that ought to be addressed. People get frustrated when it appears that the bishops refuse to do what is right. Is it possible, however, that sometimes "refusing to do what is right" might really just be "not being able to do everything at once?" I'm not saying this is true in every instance, but maybe it is true a lot of the time. What makes me ask this? I'm a pastor of two parishes (well, pastor of one and administrator of the other). I have the benefit of being fairly close to the people; seeing them each week, providing the sacraments for them, attending their family events, preaching to them every week, attending meetings with them, visiting their children in school, and a thousand other interactions. Those who know me would, I hope, say that I think with the mind of the Church. Nobody comes to our parish expecting that they will hear anything other than what the Church teaches. Nobody comes here expecting to hear some wink and a smile way to justify sin. When I first came to one of my parishes, I wanted to make certain that the school children and the religious education children were brought over to church for confession on a regular basis. If the kids thought this was painful, it was probably all the more so for the priests. In large part, the kids would come in and have no idea what to say or do. Extracting a confession from them was more difficult than extracting a tooth. They were fairly oblivious. Something great has happened over the years. The Religious Education teachers and the School teachers have done a remarkable job in preparing these students for Confession. The other day (and again, in a short while) some of our school children came over for Confession. They come in, make the Sign of the Cross, say, "Bless me Father . . . ," and make a good and thoughtful Confession. They know how to examine their consciences! It took a lot of time and it took the cooperation of the teachers. The other day, after Confessions, the two priests who were helping me both said, "Wow, the children are so well-prepared." Music to my ears! My point? It didn't happen over night. It required the patience and hard work of those teachers. It also required pastoral patience on my part. Little by little, encouraging a lot and correcting a little, we've managed to help improve one aspect of parish life. What has most impressed me is that over the long-run, the quality of confessions have vastly improved. The high school students who've been coming now for ten years have a much better understanding of sin, grace, mercy, and making an integral confession. Perfect? Not yet, but we keep working at it. Attending to that one aspect of parish life might mean that other aspects don't get immediate attention. Also, encouraging people is a lengthier process than (figuratively) excommunicating them. Pastors sometimes see the greater context of particular situations as well. So while I may see the need to correct some aspect of parish life, I see that in conjunction with the whole picture. Things take time. That's not an excuse. It is a fact. So, back to the bishops. I am responsible for two parishes. That means that ultimately I'm responsible for the pastoral care of the young, the dying, the infirm, those preparing for marriage, two Religious Education programs, Youth Ministry, the Catholic School, the Liturgy, Adult Faith Formation, preaching, teaching, sacramental preparation, evangelization, promoting vocations, two church buildings, two school buildings, two rectory buildings, a convent, a bunch of other stuff, and a whole lot of people. No matter how hard I work, tomorrow a roof will leak, a door will break, a person will make a mistake, a parishioner won't be completely faithful, somebody won't show up for their adoration period, an altar server will show up for Mass in sneakers, I will make a decision that upsets somebody, and the lector will mispronounce some key word (like, "The body is made for immorality" rather than "immortality"). That's just in two parishes. A bishop is responsible for an entire diocese of parishes and he does not have the benefit of seeing all of his people on a daily or weekly basis. None of this is to dismiss the legitimate concerns of the Faithful or their right to make their concerns known. But, in the end, these concerns ought to be made in charity and with deference to the pastoral authority of the Bishop. It's probably true that pastors and bishops have erred too much on the side of caution in the exercise of their pastoral authority. But, patience is also part of pastoral governance. In St. Paul's Second Letter To Timothy, he writes, "proclaim the word whether it convenient or inconvenient; convince, reprimand, encourage through all patience and teaching." Preaching, convincing, reprimanding, encouraging, patience, and sound doctrine are all part of pastoral governance. Reprimanding is certainly one part, but it is not the whole. Pastors (be they bishops or priests) ought not shy away from reprimanding, but neither should anyone think that reprimanding is the sole function of a shepherd. All of this came to mind today because tomorrow I am going to the Chrism Mass and will be with my bishop and all of the priests of the Archdiocese. This is a good week especially to pray for bishops and priests and to give them the benefit of the doubt. If you see moral, liturgical, and pastoral problems in your parish, diocese, or country, it's a safe bet that the shepherds see those things even more clearly. Most of us aren't ignoring the problems. We're just patiently working on them. Most of us who are parish priests get the benefit of the doubt because people see us up close and know that we are trying. Bishops sometimes don't get the same benefit of the doubt because they are a bit more distant from the people So, this week, let's pray especially for our bishops. Let them be on the receiving end of some patient encouragement.